Income Producing Equestrian Training Paradise designed for the professional horsemen. Spacious & Quiet. Move in and be open for business. Your clients will have access to 15 stalls, 2 Arenas, 10 paddocks, and 2 RV sites w 50 amp hookups. 4.2 residence makes great staff quarters or seasonal rental. 5.74 acres. 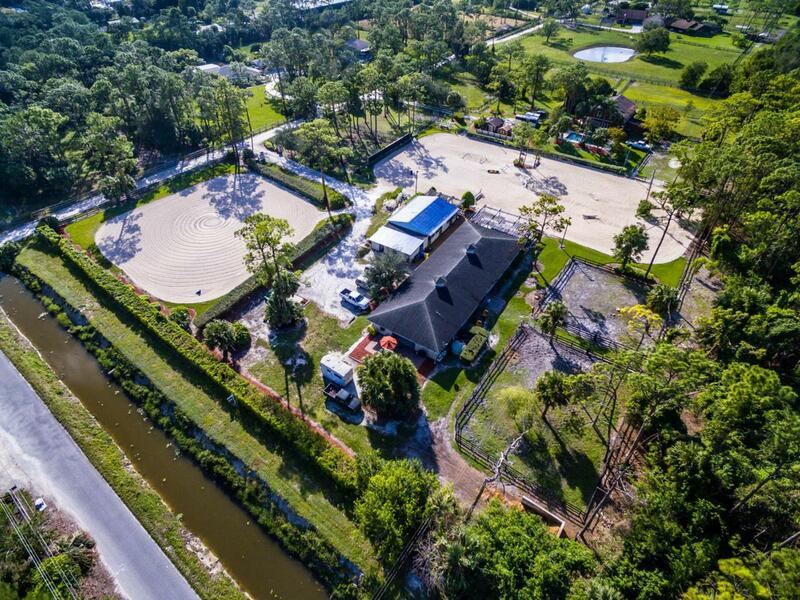 Main Barn permitted and built to PB County code provides 2 riders lounges, laundry room, full size bathroom, 1 A/C tack room for every 5 stalls, fly spray system and direct water lines and electric to each stall. Alkaline Water system also available. Arenas provide excellent custom footing: 1 - 118 x 240 FEI sized dressage arena with new 66 ft mirror wall, night lights and full jump course. 1 -130 x 140 FT arena. Covered arenas permitted. No HOA!2 separate driveways can easily be combined to created a quick in/out driveway for rigs. 1100 gallon water storage tank with pressure pump provides water during power outages. Experienced staff and existing clients in place. Entire property is on timed irrigation system. No thru traffic. No HOA. The 4 bedroom 2.5 bathroom residence would make a great seasonal rental, upscale staff quarters or personal residence. Perfect for Hunter/Jumper, Dressage or a Show & Sale barn. Easy Access for Shippers. Minutes to Wellington, equestrian venues, Palm Beach International Airport and the turnpike. Blueprints for main barn and survey under documents. BONUS: Owner is a State Certified GC with 30 years experience offering FREE consultation and estimates for any modification to the property. Lot Dimensions 387 X 642 Aprx.